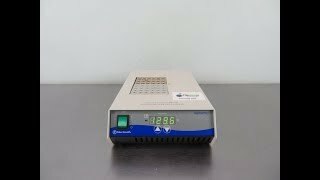 The Fisher Scientific Digital Dry Bath is a staple instrument for your lab. This compact dry heat block features terrific uniformity and control, thanks to the superior conductivity of the aluminum blocks. Users can set their parameters for this digital, microprocessor controlled heat block, at the front of the unit through the touch pad and bright LED screen. This dry bath has a temperature range of between 5°C above ambient and 130°C with a stability of stability, ±0.2°C and uniformity of ±0.4° C. This sturdily constructed dry bath is housed in a powder coated, corrosion resistant steel body, with highly conductive aluminum heat blocks. The Fisher Dry Bath holds 2 removable heat blocks at once, that can be exchanged depending on your incubation needs. This Fisher Scientific Digital Dry Bath has been thoroughly inspected, and is performing to expectations. All of our lab equipment comes backed with our standard warranty. Should you have any questions, please don't hesitate to contact us.